Boris FX is a well known leading developer of VFX, compositing, titling, and various other workflow tools for broadcast, post-production, and film professionals. Boris FX has been able to tightly integrate into the most poplar postproduction software leaders such as Adobe, Apple, Avid, and Grass Valley to name a few. Boris FX’s BCC can be found in just about any broadcaster’s edit suite, and they have their latest offering with version 9. BCC 9 is a large comprehensive tool designed to be one stop shop for all you VFX needs. 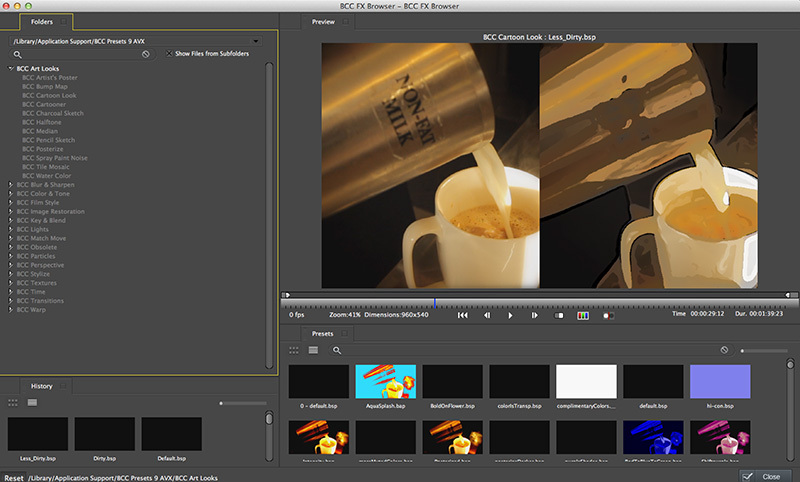 Diving further into BCC 9 and it’s workflow for Avid Media Composer can be very exciting. Let’s take a look at what’s new. BCC 9 introduces a several new features, making it more streamline and easier to use. The FX Browser allows you to view 20 new transitions that have been added as well as the classic favourites. BCC 9 also introduces new tools within Image Restoration, Film, Stylize, Composting, and Lights groups, providing you with an immense amount of 30 new effects. BCC 9 comes packed with a long list of effects, composites, transitions, and styles including a Pixel Chooser and Motion Tracker. Each of these effects and styles come with parameters that can be manipulated to your specific project. After an effect has been applied to your shot, you can access these parameters within Avid’s Effect Editor window. You can find various parameters that you can use to polish or customize the look of your effect. For example, using Film Damage effect provides you with parameters such as colour, and the ability to turn on or off the Grain, Dirt and Hair. The team at Boris FX have developed a new browser for streamlined performance and a much better user interface making it a breeze to use for any Avid Editor. The FX Browser allows you to view and preview various effects and transitions before applying it to your timeline. The new window can also be resized and re-arranged for user preference and saved as a custom set up. 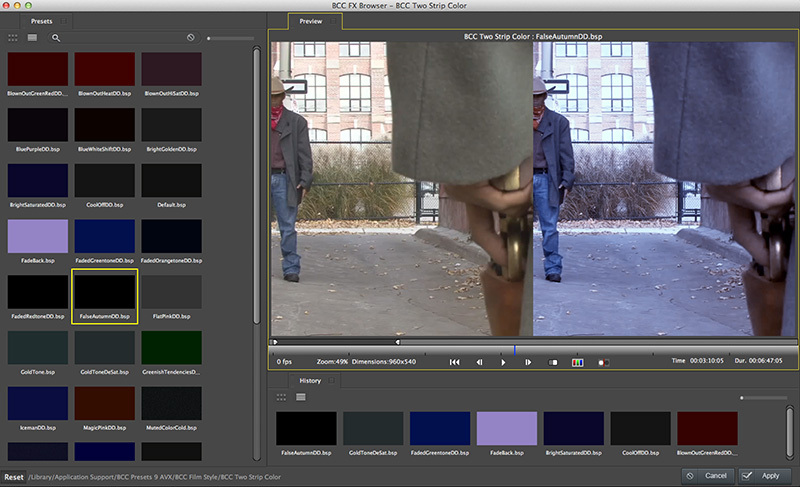 The FX Browser also allows for a split view which quickly becomes invaluable. It allows you to view your shot with before and after shots. This is incredibly useful for creating different looks and colour tones. The FX Browser is clearly become one my favourite feature within BCC 9. It has given me the ability to quickly pull up a shot, add a desired effect from the numerous presets, and then give it to my producer to preview. This has made working with my producers and directors all more fluid. 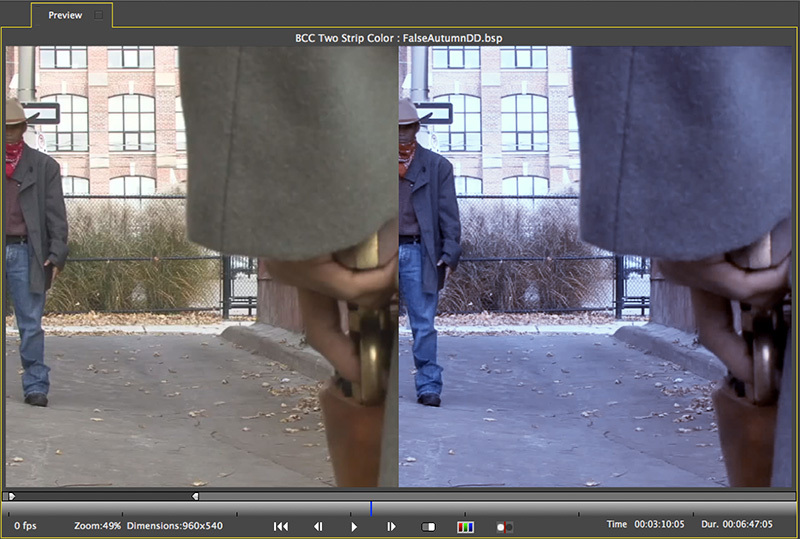 BCC 9 continues to have tools to help many editors restore footage that seemed to badly damaged to be be used. Tools such as UpRez with its unique sharpening option, Noise Reduction and Flicker Reduction, Smooth Tone for fixing beauty shots, and Pixel Fixer for dead pixel removal are now augmented by the new BCC Magic Sharp and BCC Lens Correction. All of these tools provide you with parameters that can be manipulated to perfectly dial in your restoration. to create peripheral defocusing to give a more filmic look. One application though I found to be very useful was the BCC Two Tone Strip Color. This tool emulates the historical Technicolor two-strip process where the color film effect is achieved by shooting and tinting two separate layers of film, which are then glued together for final theatrical release. I can use this tool within the FX Browser, which allows me to the split view and quickly select from a list of presets. Did I mention I really like the FX Browser? 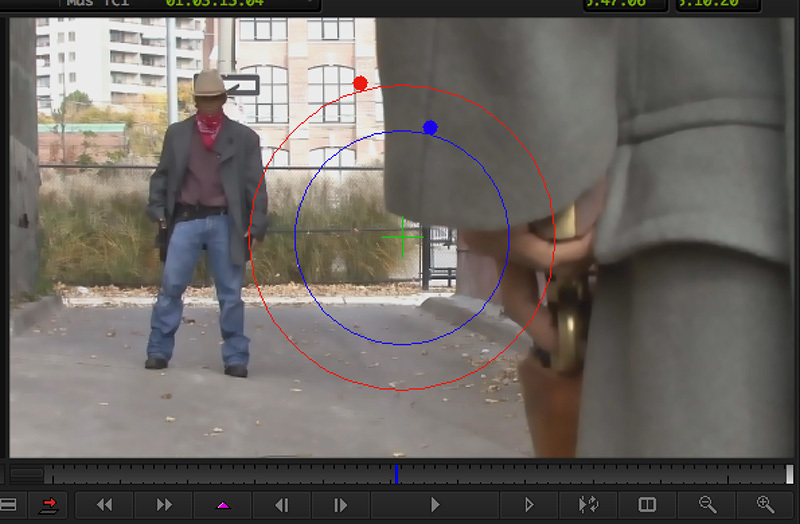 There are so many VFX’s packed into BCC 9, it’s nearly impossible to cover them all in one review posting. BCC 9 is an incredibly powerful tool. It has become more streamlined, with a slew of new features, effects and transitions to it’s arsenal. It excels at being the one stop shop for editors rather than searching across hundreds of plugins. Boris FX BCC 9 is their best release to date, and that’s no small task. Maybe, that’s why they have become a vital tool for large broadcasters around the world from the UK’s BBC to the American broadcasters such as ABC, Disney, and HBO to the Canadian giants like Bell Media.